Are the holidays all about preserving traditions for you? At my parents’ home, we focus on that to a degree. Things and people have changed over the years, but one thing has remained the same: we celebrate Christmas Eve around my parents’ table. Even after my brother moved to the United States, he came back every Christmas to share dinner with us—until he began travelling with his own family, who, if they get to choose, prefer to visit during Québec’s warm, sunny summers instead of during our unpredictable winters. Who can blame them! They’ve been through their share of snow-filled adventures. Now just five of us gather around the table on Christmas Eve, but my mom still loves to host as if we were an army. She starts baking our family’s traditional lineup of desserts in early December, and she drafts what she’s going to serve for holiday dinners very early, completing every task that she can in advance. She’s an excellent planner (that’s where I must’ve picked up my list-making-habits! ), and although she looks for new sources of inspiration every year, classic dishes frequently make a comeback—most often because we beg her to make them again. Every year, I offer to help my mom. I love chatting about menu planning with her, and on the day of our dinner, I love sharing the responsibility of setting a beautiful table, serving nicely laid out plates, and, yes, earning a bit of credit for making everyone around the table happy. I most often offer to make dessert because it’s what I love making the most, and I like to think I’ve become pretty good at it. My mom always accepts my offer, but she also can’t help but serve her classic cookies and bars along with whatever elaborate creation I prepared. To be honest, her treats often steal the spotlight. I know my desserts are delicious and she doesn’t mean to undermine my efforts, but tradition usually wins during the holiday season. This year, our holidays will be very different because we are all heading south to celebrate Christmas with my brother and his family—far from any risk of icy rain or snowstorms. While we’re there, my mom and I will both be far from our own kitchens, so we’ll be planning, cooking, and baking with a blank slate. However, I bet my mom will lead the way, and I’ll be happy to follow along. If I could bring these cupcakes in my suitcase, I would. They combine seasonal flavors in a most perfect, delicious way. The squash provides a moist crumb, the clementines introduce a delightful zestiness, and the maple gives the frosting an irresistible aroma. But what’s best about this recipe is that you can make the cupcakes right now, pipe the frosting on, and freeze them completely assembled. I believe this all-around winning recipe has the potential to breach into your family’s traditional holiday dessert lineup—I sure will try to convince my mom they deserve a starring role in ours, too. 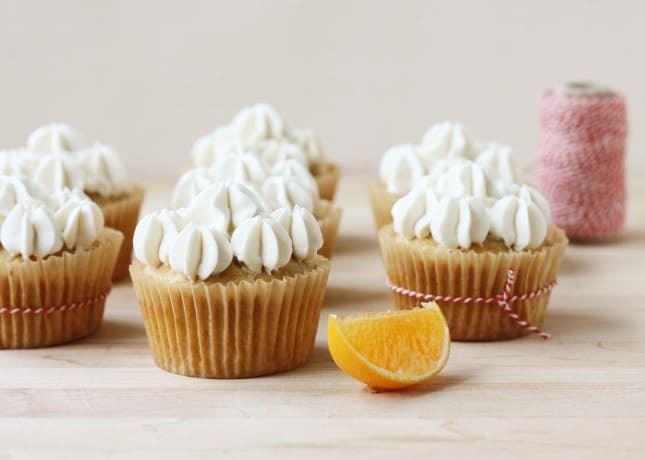 Time to add a new holiday tradition by introducing these tasty Squash and Clementine Cupcakes with Maple Swiss Meringue Buttercream to the dinner table! 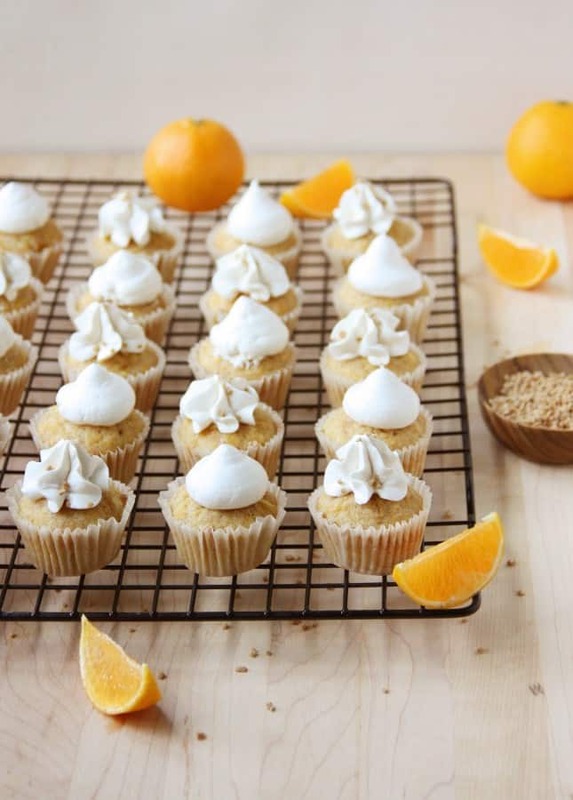 Make the Squash and Clementine Cupcakes: Preheat the oven to 350°F [175°C]. Line muffin cups with paper liners. In large bowl, mix flours, baking powder, ginger, and salt together. In another bowl, whisk eggs, brown sugar, oil, clementine juice, and vanilla extract together. Pour the liquid ingredients into the dry ingredients, and mix just until combined. Fold in the grated squash, diced clementine, and clementine zest. 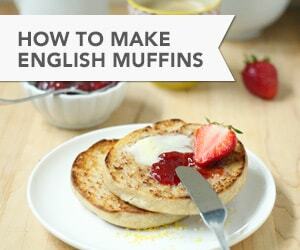 Pour the batter into the muffin cups, making sure each is only ¾ full. Bake regular cupcakes for 20 minutes, or mini cupcakes for 16 minutes, rotating the pans halfway through. Let cool the cupcakes for 10 minutes, then take them out of the pan and let completely on a wire rack. Make the Maple Swiss Meringue Buttercream: In the bowl of a stand mixer fitted with the whisk attachment (or in a large mixing bowl, if you’re using a handheld mixer), whisk the egg whites with the cream of tartar and salt until very soft peaks form. Add the maple sugar a teaspoon (5 ml) at a time, whisking, and when the sugar is all incorporated, keep on whisking until the egg whites are opaque white and stiff peaks form. Pour the maple syrup in a saucepan and bring to a boil over medium heat. Let it boil, without stirring, until a candy thermometer placed in the middle of the saucepan registers 240°F [115°C], about 5 minutes. Immediately remove from the heat and slowly pour the hot syrup in a slow stream along the side of the bowl with the egg whites, whisking constantly at high speed. Once all the syrup is added, keep on whisking, scraping down the side of the bowl as needed with a rubber spatula, until the meringue is cool to the touch, 6 to 8 minutes. Important note: It’s essential that the meringue is fully cooled to room temperature before adding the butter, otherwise the butter will melt and turn the meringue to a liquid mess. With the mixer at medium speed, add the butter by cubes of 1 tbsp [15 ml] at a time, making sure each cube is fully incorporated before adding more. Keep on adding the butter and beat until the buttercream is smooth and creamy. Frost the cupcakes: Use a pastry spatula to slather a generous amount of Maple Swiss Meringue Buttercream over each cupcake or, if you’re feeling fancy, use a pastry bag fitted with a round or star tip to pipe the frosting onto the cupcakes. 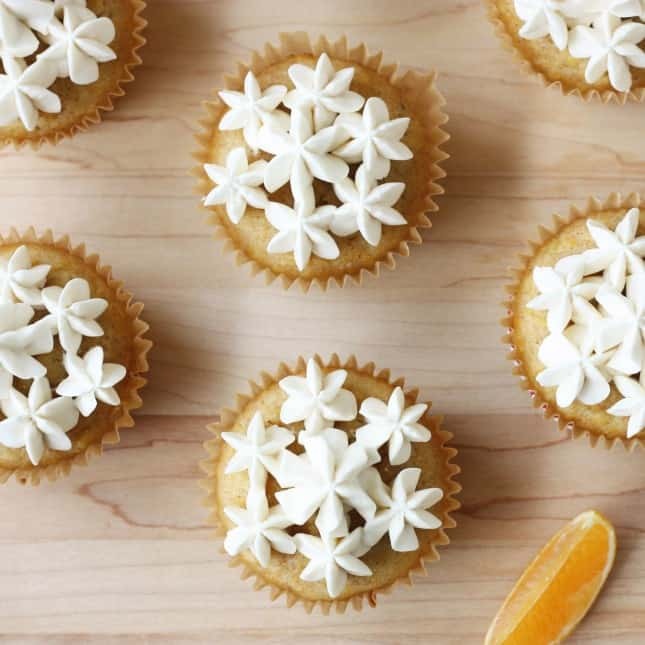 If desired, sprinkle each cupcake with coarse maple sugar and/or finely grated clementine zest. Serve the cupcakes at room temperature. If the cupcakes are refrigerated or frozen, return to room temperature 30 to 60 minutes before serving. Store the frosted cupcakes in an airtight container in the refrigerator for up to 3 days. You can also freeze the frosted cupcakes, in an airtight container, for up to 1 month. In the buttercream: Use dairy-free buttery shortening instead of butter. I use Earth Balance’s Vegan Buttery Sticks. Cake flour creates a delightfully fine and light crumb because it has a significantly lower protein content (about 7%) compared with regular all-purpose flour (about 12%), creating less gluten and keeping the texture of baked goods light and airy. 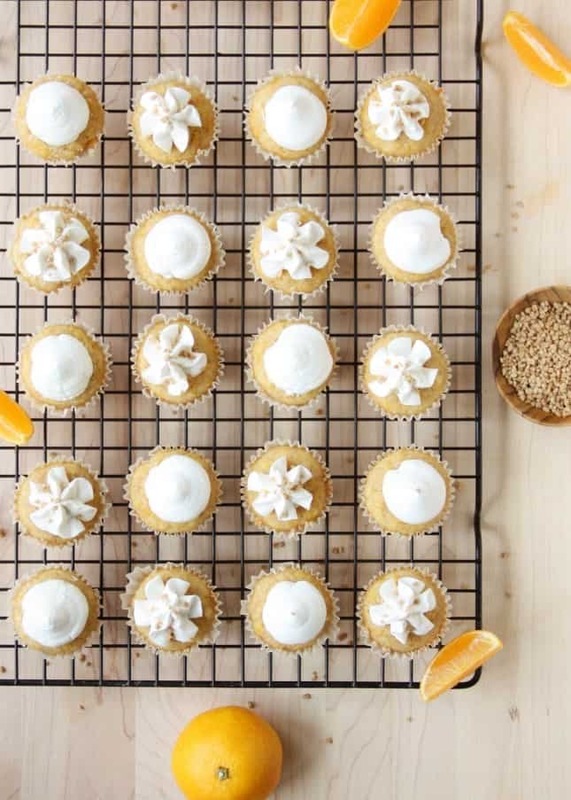 In this recipe, it also perfectly counterbalances the heftiness of whole wheat flour, allowing you to add some goodness to the cupcakes without sacrificing the texture of the cupcakes. You can make your own cake flour by measuring 1 cup [250 ml] all-purpose flour (regular or unbleached) and then removing 2 tbsp [30 ml] and replacing it by 2 tbsp [30 ml] cornstarch. Whisk to incorporate thoroughly. Check out Joy the Baker’s How to Make Cake Flour for detailed instructions. This post was created in partnership with the Egg Farmers of Canada. They offered me monetary compensation to develop a delicious recipe using their products. Every time you reach for eggs this holiday season you’re supporting Canadian farmers. Now that’s something to celebrate! As always, companies never dictate what recipes I create, or the opinions I express. I only use products I genuinely believe in. For more information about sponsored posts, please read my Disclosure Policy. Thank you for supporting the sponsors that keep Food Nouveau running! Happy holidays to you and your whole family! Your Mom sounds a lot like mine. She loves to cook for an army, too. And everything she makes is delicious. Those cupcakes look so pretty and sound absolutely wonderful. I can totally feel myself becoming the cooking-for-an-army kind of person! I already bake way more than my household can eat–and to be honest, giving the result of my work is a huge part of why I love baking so much. But I don’t mind taking a break and enjoying my mom’s treats during the holidays every year! Thanks for your kind comments. 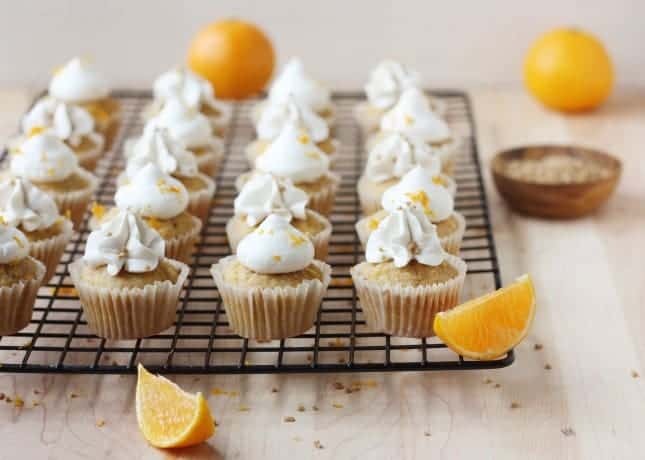 These cupcakes look beautiful, and I love that you used such an unexpected ingredient combination… I’ve never thought to use butternut squash in sweets before, but it sounds like a really delicious change from pumpkin or carrot, especially with the addition of clementine. Pinning these to try out very soon! This is such a unique recipe! Love the combo of squash and clementines. We are also heading south for Christmas this year, so I’m not sure what kind of baking I’m going to be able to do. Depends on what ingredients I can find in the stores down there! Merry Christmas to you! Happy holidays Sarah, and enjoy a warmer Christmas with your lovely family! Thank you Justine, and to you too! Yes, I can’t stop eating clementines these days, and I love using them in baking too. They’re the perfect ray of sunshine on a bleak winter day! Happy holidays to you. They look delicious! I love the addition of squash in them. Yummy combination! Thank you Ilona, it’s an irresistible combination indeed!